In May of 1964, eleven-year-old Etta McDaniel’s horse is struck by lightning—dead and gone, she hopes— out of her life “as though he’d never come in the first place, bringing with him one catastrophe after another.” But Troy, gruesomely scarred, not only survives but seems to have gained supernatural powers, which Etta sets her mind on harnessing in her search for treasure. She is convinced that a find of the sort her hero Heinrich Schliemann unearthed at ancient Troy will set to rights everything suddenly gone wrong in her life: rivalry and betrayal at home and social unrest reaching even her family’s farm. Half-blind and crippled, the horse does lead Etta to treasure—though not to the treasure she dreamed of. Along with her shell-shocked grandfather, the family’s African American housekeeper, and the widow of a Mohawk chief, the lightning-struck horse initiates her into the world of “action and liability” as the Civil Rights Movement takes hold in her rural South. Etta comes to understand that this world was never perfect, with its economy dependent on tobacco and before that on slavery, as excavations on the farm reveal. Once unearthed, the ugly truths of history scar Etta and set her, in a figurative sense, upon the back of the lightning-scarred horse and on the journey of her life. 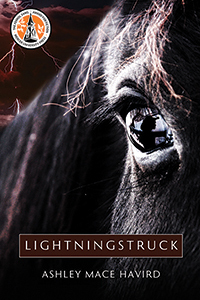 Full of mystery, tension, and the very real and often turbulent history of rural South Carolina, LIGHTNINGSTRUCK is an engrossing and enchanting story. It’s rare these days to find a good poet who can also write fine fiction. It turns out Ashley Mace Havird is one of these. I read LIGHTNINGSTRUCK with great pleasure, and felt entirely in the spell of her prose. I won't soon forget Etta McDaniel and her journey. What a rich witness of a culture and a world. "Even before my horse got struck by lightning--a crazy thing all by itself--the world had gone stark raving mad.” So reads the superlative first sentence of Ashley Mace Havird’s debut novel, LIGHTNINGSTRUCK. And who wouldn’t want to read further after taking in these words. It’s impossible not to wonder if the horse survived--you quickly find out it has--and why 11-year-old Etta McDaniel believes her world has turned crazy. The first chapter of Havird’s novel fulfilled the promise of that sentence, garnering my Best of Show award in the literary competition of the Shreveport Regional Art Council’s Critical Mass 4. Her novel is set in the tobacco country of South Carolina, where Havird came of age, and the time is 1964. Most of us have read one classic coming of age novel or another. A list of enduring books in this vein would include the ADVENTURES OF HUCKLEBERRY FINN, THE CATCHER IN THE RYE, and TO KILL A MOCKINGBIRD. To this list I would add a recent example of note: Donna Tartt’s THE GOLDFINCH. The great appeal of these narratives is to feel as if the author is speaking directly to you. The magnetic voices in these novels pull you in quickly--and Etta’s does too. If the question about the survival of Troy, Etta’s horse, is disclosed in the first pages of the book, the bigger question is one the reader has to answer for him or herself. Are the events in Etta’s world signs of madness? At least in some measure, the term rings true to an 11-year-old girl’s way of seeing her world. But we should keep in mind that many a boy or girl of that age has a flair for melodrama and hyperbole. So much of the novel is anticipated and hinted at in its first chapter. There is the gap between the horse Etta yearned for and the horse she has. There are her complex relationships with Cleo, the housekeeper who has essentially raised her and who she loves deeply; with her brother Will, who gets bullied at school for his cleft palate and who Etta feels compelled to protect; and with her grandfather Mr. Mac, who puzzles Etta by his low key reaction to events that trouble her deeply. Then, intertwined with all of these bonds is her relationship to the physically damaged horse, Troy, which she resents and yet is still her responsibility. Each of these characters is richly realized, including Troy. While the story centers on a girl of 11, it is not only a book for young readers. It is also for adults looking back on childhood and the complexities of the world that reveal themselves as we come of age. Like the ADVENTURES OF HUCKLEBERRY FINN, it can be read in different ways by people at different stages in their lives. This idea of levels in LIGHTNINGSTRUCK for readers of different perceptions and stages in life is actually built into the structure of the book, since one of its major motifs is archaeology. Troy acquires his name because Etta is so enamored with a book called ANCIENT WONDERS OF THE WORLD, highlighting the stories of ancient civilizations and the pioneering archaeologists who excavated them. This act of excavation, both literal and symbolic, is crucial to Etta’s story in this book, as she comes to term with everything from death to segregation to racism to the complexities of love in her family, her tiny town, and in the world beyond. The novel also suggests how the shift from childhood to adolescence is about looking beneath the veneer of the social world around us, unearthing societal tensions as well as the complex history of one’s family and region in the process. She sees how the Civil Rights Movement is affecting relations between people she knows well. Cleo offers her an empathetic perspective on the words of Dr. King, which collide with those of elderly white fellows who hang out at the town store. And Etta is trying to reconcile these conflicting views of race and community. The subtle dramatization of her newfound complex view of the world and the fully rounded characters that live it make this novel truly memorable. Of course, as in all elegantly structured novels, you shouldn’t take the narrator too literally. Madness and evil are highly subjective terms and at least partly ambiguous ones, as the chapters of Havird’s luminous debut novel makes clear.